Prime Minister Vladimir Putin has observers scratching their heads over his dramatic appeal to build a “unified civil front” of political parties and social groups to confront an unspecified national dilemma. The idea sounds baffling since Russia, despite its various issues, does not appear to face a looming crisis that would justify putting aside political differences for the common good. Some experts scoff that the unmentioned emergency is Mr. Putin’s own poll numbers. Putin, who is widely suspected to be eyeing a return to the presidency, saw his numbers plunge in recent polls and rating for the party he leads, United Russia, also dropped. RELATED: Putin’s marquee moments. 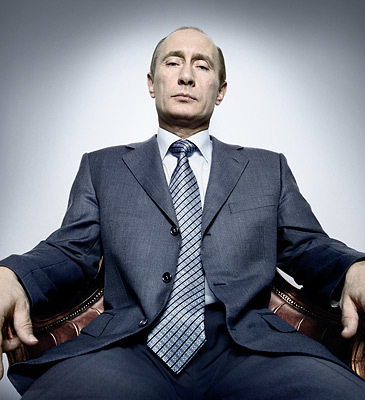 But a few critics warn darkly that Putin may be seeking to reshape Russian political culture into one of forced social unity similar to the former Soviet system, in which all of civil society – including media, trade unions, the church, youth, women’s groups, even sports clubs – were held in captive orbits around the all-powerful ruling party. “I propose the creation of something that in practical politics is called a unified civil front, an organization to unify the efforts of various political forces ahead of major events of political character,” Putin told a conference of United Russia in the central Russian city of Volgograd last Friday. The front should recruit into its ranks all organizations and people “who are united by the idea to strengthen our country and by the wish to search for the most optimal ways of solving current problems,” he added. Putin spent much of the long weekend (Monday was Victory Day, a major holiday in Russia) meeting with business and social leaders to test the idea, which would include opening up as much as a third of United Russia’s candidate lists to nonparty members affiliated with the new front. “United Russia needs an inflow of fresh ideas, fresh proposals, and fresh faces,” he told journalists. Sign up for our daily World Editor’s Picks newsletter. Our best stories, in your inbox. United Russia, the state-backed political behemoth whose membership is packed with officials, has given Putin near undisputed control over most legislatures in Russia for nearly a decade, including a two-thirds majority in the Duma. But lately its public approval rating has slumped dramatically. The party, which won 67 percent in 2007 Duma elections, was supported by just 43 percent of Russians, according to an April survey by the independent Public Opinion Fund (FOM). First of all, Vladimir Putin remained strangely neutral during the ousting process. If Medvedev had really launched a war, we all know Putin would not have reacted that way… It’s not facts but common sense! Moscow’s portly mayor, Yuri Luzhkov, has been one of the most visible figures in Russian politics for 18 years. But his sacking by President Dmitry Medvedev caps a year in which a number of other long-lived local heavyweights have bitten the proverbial dust, consolidating the Kremlin’s authority as well as Mr Medvedev’s personal power. Mr Luzhkov’s power was that of a feudal baron – allowed to rule as he saw fit as long as he delivered comfortable majorities for the ruling United Russia party in elections and maintained stability in the capital, say analysts. But Mr Medvedev has been quietly replacing a number of politically independent strongmen in sensitive local posts. They include Mintimer Shaimiev, president of the autonomous region of Tatarstan, who stood down in March after 19 years in the job, and Murtaz Rakhimov, president of Bashkortostan, who left in July, having been in the post since 1993. According to Masha Lipman, analyst at the Carnegie Moscow Center, the think-tank, Mr Luzhkov’s ouster is part of a pattern in which the Kremlin replaces figures who have a strong local basis of support with appointees who owe their jobs to Moscow. “It is quite legitimate to regard [Mr Luzhkov’s ouster] as an element of a single policy,” she said. Many political analysts believe the post of mayor may now be split into two jobs – mayor and chairman of government – which would weaken the position and ensure that the Kremlin will never again have a figure with Mr Luzhkov’s stature to contend with. Konstantin Remchukov, chief editor of Nezavisimaya Gazeta, the respected Moscow daily, said that there were important nuances to Mr Luzhkov’s sacking that show Mr Medvedev gaining authority in his job. Both Mr Shaimiev and Mr Rakhimov formally stood down voluntarily. Mr Rakhimov was even given a high state award for his services, thought to be a sign that Mr Medvedev was unable to force him out of power without a compromise. The ouster of Mr Luzhkov marks the first time Mr Medvedev has used his constitutional power to fire a powerful local leader and demonstrates his “political evolution”, according to Mr Remchukov. “To be taken seriously in our hierarchical society, you need to demolish someone powerful,” he said. He drew a parallel with the arrest of Mikhail Khodorkovsky, oil tycoon, in 2003, which confirmed Mr Medvedev’s mentor, former president, now prime minister, Vladimir Putin, as the all-powerful leader of Russia. Mr Medvedev’s move is seen as exceedingly risky by some observers. Mr Luzhkov was no outsider, he was one of the founders of the United Russia party, currently headed by Mr Putin. His rough handling by Mr Medvedev could create tensions within the party and pitch Moscow politics into turmoil with only a year to go before 2011 parliamentary elections. But Ms Lipman contends that Mr Medvedev had little choice but to fire Mr Luzhkov, given the mayor’s defiance and his personal criticism of the president that ignited the conflict earlier this month. “Had Medvedev failed it would have made him look exceedingly weak,” she said. The Luzhkov crisis, which began on September 10 with the first broadside against the mayor in a Kremlin-directed TV campaign also showed Mr Medvedev making decisions seemingly independently of Mr Putin. Mr Medvedev has always been seen as the junior partner in the ruling “tandem” and it is thought that all decisions on major issues are agreed between the two. Natalia Timakova, Mr Medvedev’s spokeswoman, confirmed to reporters that Mr Medvedev had informed Mr Putin of the decision in advance.“Of course, Luzhkov was fired by a joint decision of the tandem . . . Dmitry Anatolyevich [Mr Medvedev] . . . would never decide appointments, even appointments which are within the president’s area of competence, on his own,” said Alexei Venediktov, editor in chief of the opposition-friendly radio station Ekho Moskvy. Mr Putin stayed overtly neutral throughout the campaign against Mr Luzhkov, making no public attempt to interfere on either side, although officials close to Mr Putin briefed reporters that Mr Luzhkov should resign, just as officials close to Medvedev did. “Putin was watching from the sidelines to see how Medvedev performed,” said Mr Remchukov. But the next stage of the game will show whether Mr Medvedev has the power to independently name Mr Luzhkov’s successor, or whether the successor will be a Putin appointee. “Medvedev has shown that he has the power to fire but he has not yet shown if he has the power to appoint someone without agreeing it with Putin,” said Mr Remchukov. Olga Kryshtanovskaya, a Moscow State University sociologist, said the succession question in Moscow is a prelude to the much more important presidential succession to be decided in 2012, which is whether Mr Putin returns to the presidency or Mr Medvedev has a second term.